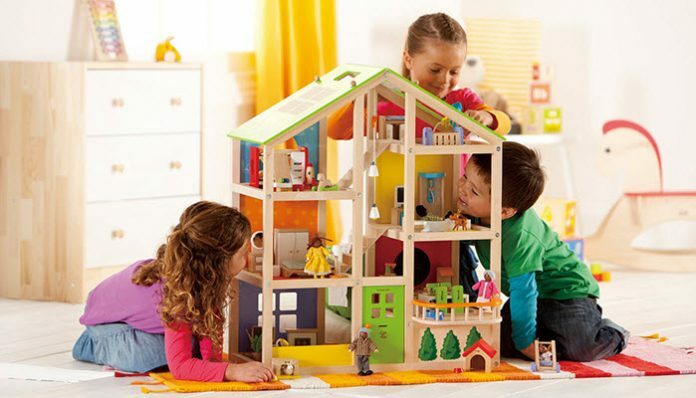 Playtime for kids are not just for leisure and a toy such as a dollhouse could enhance their imagination. Dollhouses are a great way for little girls to formulate stories in their heads and playing with them help them act these stories out in a healthy way. There different ways that playtime could help children’s development. Here is a good read on how imagination and play are essential to healthy childhoods. Pets are also a great way to engage children in healthy activities. It will help them build habits and routines and enhance their empathy for others. Low maintenance pets such as hamsters are great starters for pets to teach kids about responsibilities. If you decide to get them a small pet like a rat or a hamster, here is a great guide on the best hamster cage to help you get started. So how do you choose the right dollhouse for your little girl? Should it really be that complicated? We’ve made a list of the best ones available that would help her maximize her play. On the top of our list is the KidKraft Chelsea Doll Cottage with Furniture. It features three levels of open spaces where they can design their imaginary home. It includes a total of 17 furniture which they can relocate or place in specific rooms to enhance their imagination. The windows open and close for added effect. It includes two plastic molded staircases where their imaginary characters can go up or down. This dollhouse is large enough to allow multiple children to play, encouraging creativity and collaboration in children. It has an attractive pink and blue design perfect for young girls. The Calego Classic Doll House comes second. It’s a traditional dollhouse suitable for 12 inch fashion dolls. It features three stories which would encourage your little girl to stretch their imagination. There are illustrated furniture and decorations that you would find in a real house. One disadvantage is that it could not really fit any additional physical furniture toys. The great thing about this toy is that it is easy to store when not in use. You can fold it flat in a few easy steps to make storage a breeze. It is made from soft, safe and lightweight materials. 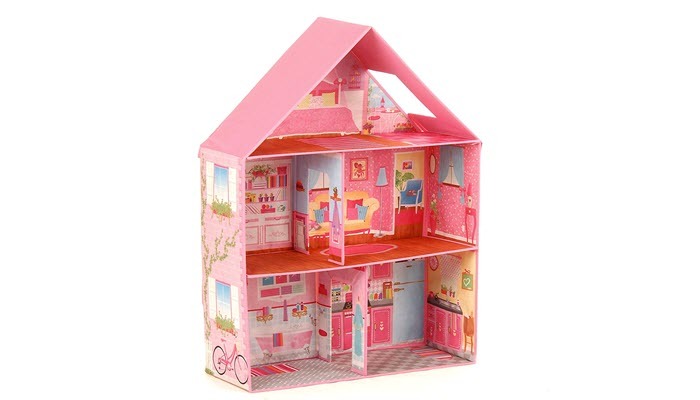 The Melissa and Doug Fold and Go Wooden Dollhouse is also a great option. It features beautiful details that make playtime lots of fun. It comes with a hinged door which will let play figures in and out. 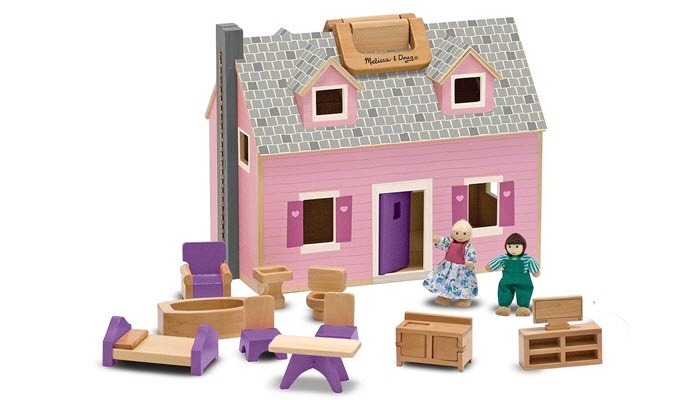 Your little girl can arrange the included furniture and makeup stories about the people who live in the house. This house comes with two chairs, a table, bathtub, TV, and many more. It’s a two story home in a nice wooden design. It opens for easy access and folds close for convenient storage. It also includes a sturdy handle so it’s easy to take from one room to another. 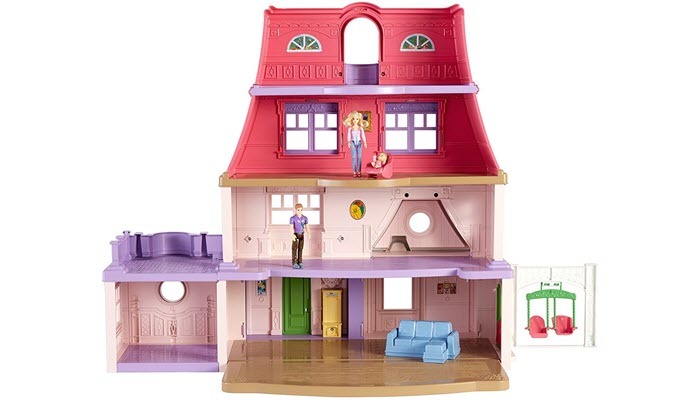 Another nice choice is the Fisher-Price Loving Family Dollhouse. This is a bigger model that includes 4 floors and spacious rooms. It features fun sounds to make the play more realistic. The set includes the family – mom, dad, and baby. It also includes some furniture which they can move around and arrange. There’s even a flip-out swing set that includes two swings. The house opens wide for hours of playtime and folds easily for storage. 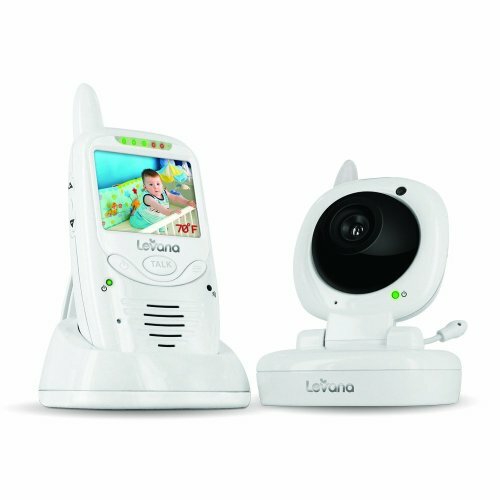 This is a great toy for parents to play together with their kids. 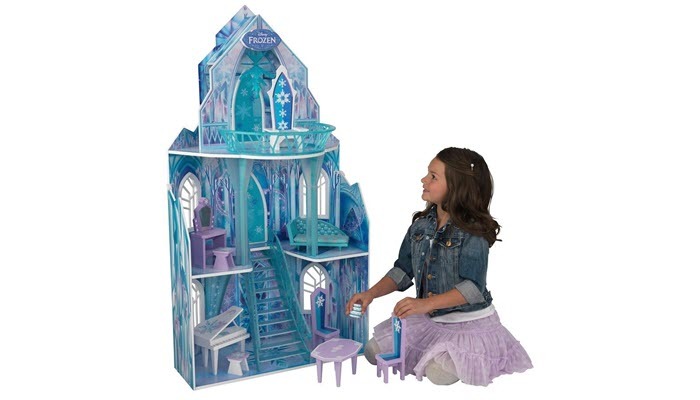 If you want something more magical, the KidKraft Disney Frozen Ice Castle Dollhouse is perfect for your girl. This is a little bit more expensive but has great quality and size. If your little girl loved the movie Frozen, she will appreciate this toy. It can accommodate Barbie dolls and other fashion dolls up to 12 inches. It includes 11 detailed furniture pieces including the icy throne and chandelier from the movie. This features Frozen themed artwork in every panel. 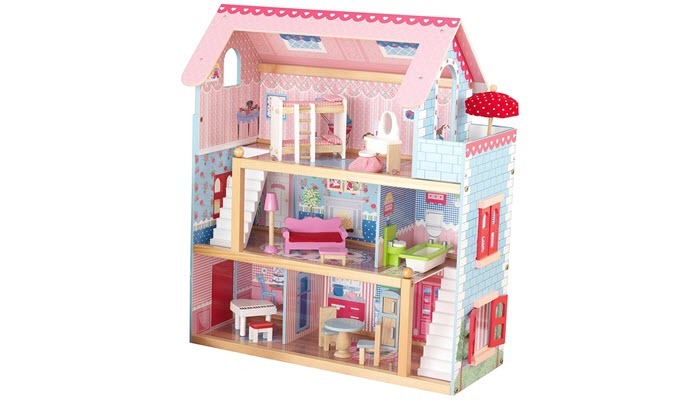 The dollhouse is suitable for girls aged 3 and up. It’s also large enough for other children to play with. 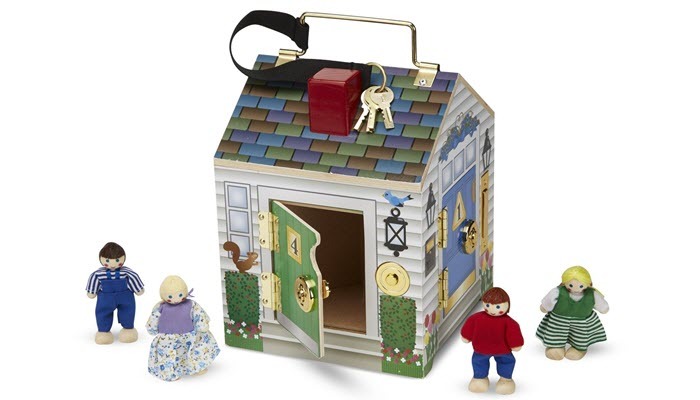 The Melissa and Doug Take-Along Wooden Doorbell House is a great affordable alternative. It’s a smaller version that includes four doors with doorbells to ring as well as lock and key pairs. It also includes four play people that your child can move around and bring together. The matching keys and lock help in developing your girl’s problem-solving skills. This toy is great for younger girls. It has an attached carry handle so it’s easy to transport from one room to another. It has a sturdy wooden construction and a nice detailed traditional design. Choosing a dollhouse depends on your girl’s age. It would also depend on their taste as well as their personality. Some dollhouses are suitable for older kids while others may only be enjoyable at a younger age. Others grow with your child. You also need to consider the included accessories. If you have a younger girl or a toddler, you should stay away from those with small parts as they may ingest it. Think about where you want to place the doll house. 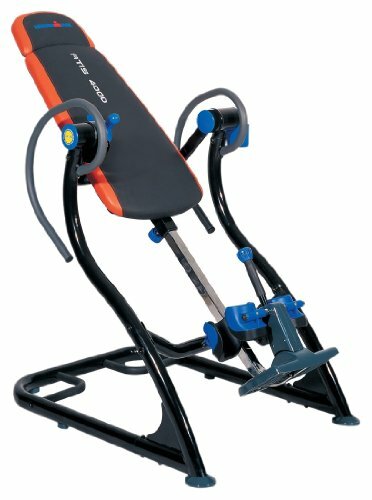 It should fit the space and not be a hazard on your child’s way. Also, other kids find very big houses overwhelming while others find small ones uninteresting. Think about your child’s tastes and personalities when considering the size. Dollhouses come in different themes and designs. Others look more traditional with Victorian themes. Some are more modern and have urban styles. You need to know what kind of dolls your little girl is fond of playing with. 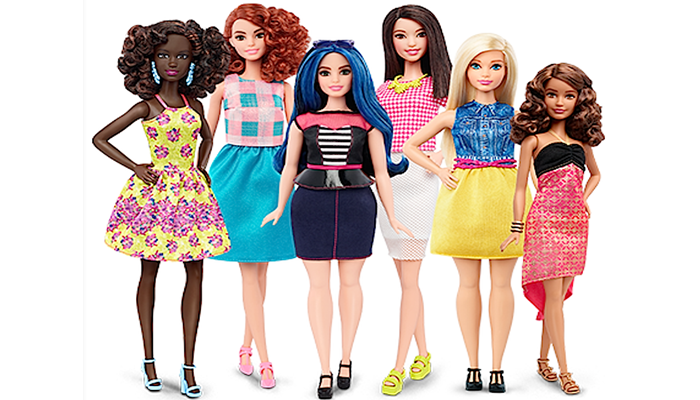 If she likes bigger fashion dolls, then you should choose a house that accommodates dolls up to 12 inches. Some of these toys can be expensive so make sure that the materials are durable enough. Girls usually play with dollhouses for years so consider it a form of investment. Also, think about encouraging friendships and collaboration when choosing a dollhouse for your child. Some are big enough so they can play with their playmates which are also great for their development.